Balanced handling and the 'best of both worlds' spec. There are three distinct platforms in Kona’s new Process range and they all come under the enduro banner: the Process 111 29er and two 650b bikes, the Process 134 and the Process 153 tested here. The numbers in the names indicate the exact amount of rear travel each bike has in millimetres, but they all share a similar attitude irrespective of wheel size, with handling defined by short chainstays, 40mm stems and long front ends. To keep things simple, there are only two models of each bike, where the DL tag indicates the higher specced deluxe versions. Regardless of the price point, all of the Process bikes feature RockShox suspension, dropper posts and Maxxis tyres, to guarantee that they are primed for action straight off the shop floor. Frame stiffness and ample standover clearance are also key to the Process family, and the 142x12mm rear end on the 153 DL, especially the seatstays, is one of the chunkiest we’ve seen. This bike is seriously solid. Kona uses an extender yoke, similar to that on the Specialized Enduro Expert Carbon, to eliminate one of the shock’s DU bushings and help reduce friction in the suspension. One key difference, however, is that Kona’s design doesn’t require a custom shock body, making it possible to fit any shock. Not that you’ll need to upgrade the excellent RockShox Monarch Plus that’s fitted as standard. Kona’s single-pivot design is plush and progressive, with plenty of mid-stroke support when cornering hard. In contrast, the 160mm Pike fork initially offered noticeably less support on the descents. So, after a couple of rides, we added a second ‘bottomless token’ and this instantly balanced how the suspension ramped up front and rear, without robbing the fork of sensitivity or grip. The 2×10 drivetrain on the Kona gives it a massive range of gears for backcountry epics. We also like how the closer ratio cassette always gives the perfect gear for every situation — never too high or slightly too low, as is sometimes the case with SRAM’s 1×11 set-up. That is, providing the chain actually stays on, which, 50 per cent of the time, it didn’t. In fact, we’d forgotten how frustrating it is to have a front mech on a longer-travel bike. The noise of the chain is unbearable, but it’s nothing like as annoying as going to sprint out of a corner or crank for a gap jump only to find that, once again, the chain is dangling around the BB. The same thing happens every time you stop for a breather or to regroup. Moving to a 1×11 drivetrain would be a massive improvement on the 153 DL, and it would help shed some weight too. If Kona doesn’t want to stretch the budget that far, at the very least, it needs to fit a lower chain guide. In addition to the chain coming off, the cones on the Shimano XT rear hub kept working loose, and we know from experience that they aren’t the most reliable or lightest pieces of kit. 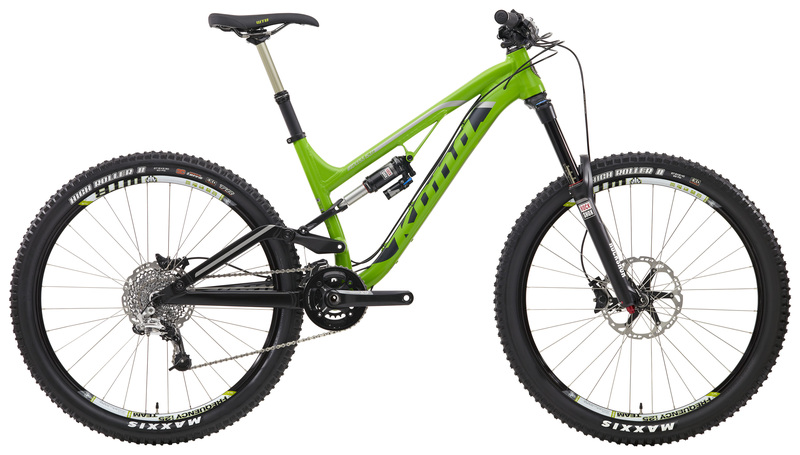 The Kona Process 153 DL has seen more action than any other bike in this test and it is still going strong. It’s carrying a couple of extra pounds but it’s also hard as nails. Everyone that’s ridden the Process 153 DL has come away surprised and impressed in equal measure. The bike has incredibly neutral handing, making it easy to ride flat out straight from the get go. For an ultra-short chainstay bike, it is not that easy to manual, because the extra length up front shifts your weight forward into a more neutral stance on the bike. A key benefit of that is that you’re not constantly hanging off the back of the bike in corners and struggling to load the front tyre. The extra length up front also aids high-speed stability, and even when you reach the limits of the 153mm of rear travel the Kona keeps pressing on at a blistering pace. Kona is back in the game. The Process 153 DL is a truly amazing bike that’s fun, fast and super-easy to ride. All of the fundamentals that actually affect performance are accounted for: great geometry, dialled RockShox suspension, consistent Shimano XT brakes and sticky Maxxis rubber. In fact, the only things holding the Process back are that it’s a touch heavy and the chain keeps coming off. Still, it’s a really solid bike that will definitely go the distance; you’ll just have to work a little bit harder on the climbs.